Learn about Little Rock, Arkansas by reading Things are Rockin' in Little Rock by Charlie Spence, Aviation Writer. It features a mini, but thorough tour of the destination, plus all you'll need to know to plan your trip including getting there, objective information on places to stay and eat, and things to do. At the end of the article, we've provided a summary of the contact information for your easy reference. Enjoy! 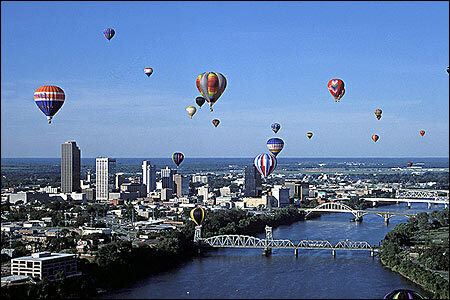 Little Rock skyline during a balloon festival. Whatever your political philosophy might be, a visit to a presidential library can be an inspiring event focusing on the values of America. That's why going to the Clinton Presidential Center should be one of your first stops in a visit to Little Rock, Arkansas. Little Rock and North Little Rock form the vibrant heart of Arkansas. Around this region you will find fun, education, beauty, historic attractions, and opportunities for leisurely visits to museums or active nightlife and day action. As we suggested, let's start our visit down town at the Clinton Presidential Center. It is right downtown on the banks of the Arkansas River. The main building takes the form of a glass bridge, symbolizing President Clinton's theme of 'Building a bridge to the 21st century.' In it we will visit replicas of the oval office and the cabinet room. Then wander over to the 20,000-square-foot museum. An adjacent building houses the University of Arkansas Clinton School of Public Service located in the renovated 1899 Choctaw Station. 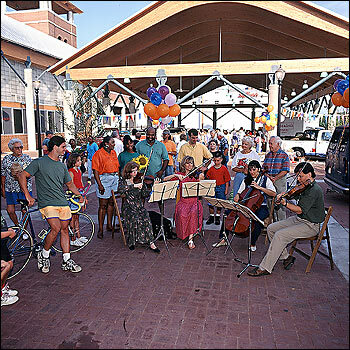 Entertainment is one of the attractions of the River Market District. Courtesy Arkansas Dept. Parks and Tourism. From here it is a short walk to the River Market District. Until ten years ago, this was a nearly-abandoned warehouse area but now is filled with shops, restaurants, art galleries, bars, and seasonal farmers market. It is the site of some of Arkansas' art galleries, museums, theaters, concert halls, and other entertainment facilities. There are dozens of small shops where you can lose yourself in quests for interesting items from bath and body goods to antique furniture and pieces of art. Some fine hotels are located here and the River Market is enticing enough to spend your entire journey right here. But travel on, we must as there is so much more to see and do. 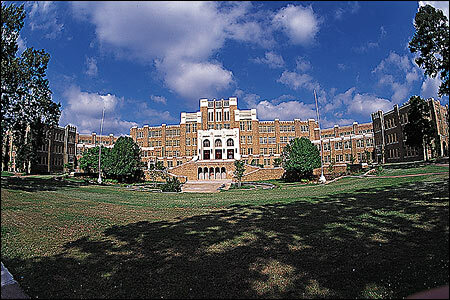 Another historic place to visit is the Central High School. This major U.S. Civil Rights Landmark is still a working school. It was here in 1957 that a major confrontation occurred between then-Governor Orval Faubus and President Dwight Eisenhower. Faubus had called out the National Guard and stood in the doorway of the school to prevent entry by the first African-American students - 'the Little Rock Nine.' Eisenhower sent in federal troops to enforce desegregation. Across the street from the school the Central High Museum and Visitors' Center features a permanent exhibit that depicts the struggle through exhibits and photos. For a full exploration of Arkansas military, take in the MacArthur Museum of Arkansas military history. It is located in the historic Tower Building, birthplace of Gen. Douglas MacArthur. This National Landmark was built in the 1840s and depicts Arkansas military from pioneer days to the present. Now a national historical site, Central High School is the site of the 1957 Civil Rights confrontation. All of Little Rock's history can be found in the interesting visits to sites in the Quapaw Quarter. This nine-square mile area includes the city's central business district and adjacent neighborhoods. (The word 'Quapaw' is from the Quapaw Indians who lived in central Arkansas in the early 19th century before white settlers came.) It is here that you will find the MacArthur Museum, Central High School, and many other restored buildings. The structures in this area date from mid 1800s to about 1920. Most of them are occupied structures and not open to the public, but a walking or driving tour past them can reveal how the historic preservation efforts have progressed over the past 40 years. Be sure to spend some time at the Aerospace Education Center and IMAX theater. Several different movies play daily on a six-story screen. There's also a rare Sopwith Camel F-1 aircraft and a full-size replica of Apollo command module. As much as there are interesting places in Little Rock, the surrounding area also holds fine attractions. North Little Rock beckons. Wander over to the authentic reproduction of a water-powered gristmill. If it looks familiar, you saw it in the opening scene of classic film 'Gone With The Wind' and is believed to be the only building from this film that is still standing. Although built in 1933, it was designed to look as though it was a product of the 1800s. Also here in North Little Rock is the 311-foot submarine that was present in Tokyo Bay at the signing of the surrender ending World War II. (The USS Razorback was named after the whale, not the fighting sports teams of the University of Arkansas.) After it was decommissioned, it was sold to Turkey and thirty years later obtained by North Little Rock and now serves as the foundation for the Arkansas Inland Maritime Museum. Only 20 minutes southeast of Little Rock visit two tiny communities - Scott/Keo - that have the flavor of the old south. Antique aficionados will find Keo a delight. Morris Antiques boasts more than 60,000 square feet of American and European pieces and there are several other stores featuring a wide array of offerings. To satisfy your sweet tooth, take a rest in Charlotte's Eats and Sweets, a delightful stop in an old pharmacy complete with an original walnut soda fountain and cabinets. Scott is a plantation settlement depicting a typical plantation with Cotham's, a restaurant offering down-home cooking. A fine way to cap off one of your evenings is to take a river cruise on the beautiful Arkansas River aboard the Arkansas Queen. You can enjoy a fine dinner, dance to the music of the Riverboat Ramblers, or just relax stretched out on one of the deck chairs. During the trip the captain's commentary will give you a new understanding of the area. 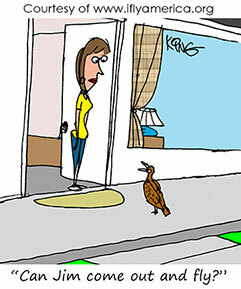 You will see Little Rock and North Little Rock differently than when touring the streets. If you have time to move away from the city attractions, take a tour through the Ozark foothills for feel of the mountain living. Head out highway U.S. 67-167. One of your first stops should be the William Carl Garner Visitor Center. This provides museum exhibits, a movie, and information to help you enjoy the area. Take state road 5-25 to the little town of Mountain View. You'll see the sign directing you to Ozark Folk Center. At the center enjoy the folk culture, hear traditional American mountain music, and even learn to play the dulcimer, autoharp or fiddle, or learn hand quilting or wing broom making. Another unique spot to get the flavor of the Ozarks is the town of Calico Rocks, on the banks of the White River. Its historic downtown area will give you a fine sense of the quiet atmosphere of small town mountain living. In a few days or an extended stay, you'll pleasantly discover that there is nothing little about Little Rock. There's a wide range of tourist accommodations in and around Little Rock to suit your likes and purse. They range from inexpensive motels to plush suites. Some are in the center of the River Market District; others are only a short trolley ride away. Two Bed and Breakfasts are popular. They are: Empress of Little Rock where you can sleep on feather beds in the opulence of a 1800s structure; and Rosemont in the River Market District that is a Victorian era's gentleman farmer's in-town estate. Check the many lodging sites at http://www.arkansas.com/, then book your reservations through IFA's Online Travel Booking Service. Deep discounts apply. Cajuns Wharf Seafood Restaurant. Dine overlooking the Arkansas River and enjoy entertainment and dancing. Cotham's in the City. The legendary Hubcap hamburger must be tried before you leave the area. They also feature southern-fried catfish and Mississippi Mud deserts. Ernie Biggs. Not just good food but an entertaining dueling piano bar with different prominent piano players coming to town for your entertainment. Bosco's. Try the fresh salmon baked on a cedar plank in Bosco's brick oven. Notice: This information is current as of August 2006. It is recommended that you contact the numbers, and/or visit the websites above to determine any changes to the information.